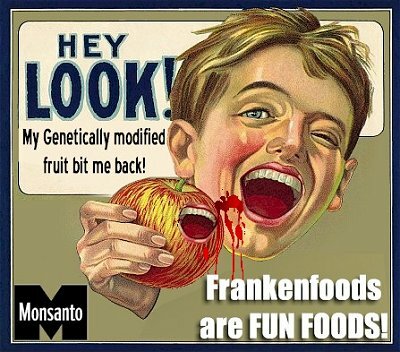 Unless you live in Europe, or you have a 100% organic diet, or you grow everything yourself, there’s a good chance that your family eats genetically modified (GM) food at least weekly. Maybe more like daily. Most of the corn eaten in the U.S. is genetically modified, and so, in turn, are the countless corn-derived ingredients-from Xanthan gum to high-fructose syrup-that go into processed food. (Roughly 70 percent of processed foods have at least one GM ingredient.) Your kitchen may contain peanut butter spiked with GM soy oil or farmed salmon that was genetically engineered to grow faster and bigger than its wild counterpart. It’s undeniably creepy to think of scientists tinkering with the genes of the plants and animals we eat. And yet plant and animal breeding has been going on for thousands of years. Many scientists say genetic engineering is a more precise and innovative form of traditional breeding. While GM foods have been restricted in many countries, the UK is now considering lifting its restrictions.Advocates insist these high-tech foods can cut pesticide use, boost crop nutrients, and improve the quality of food. All this leaves us wondering: How bad is GM food for us, really? And could it possibly be good? On the environmental website Grist.org, Nathanael Johnson is doing a fascinating investigative series on GM food in which he writes: “Is there any evidence that genetically modified food is directly harmful to people who eat it? There’s a one-word answer to this: no.” He adds that “millions of people have been eating genetically modified foods for the past 20 years without any obvious ill effects.” But the key word here is “obvious.” Johnson cautions that we don’t yet know whether the ill effects of GM foods could be “subtle and chronic.” Are they influencing growing phenomena like allergies that have unclear origins and affect only certain parts of the population? There’s no conclusive answer-the research is still shockingly inadequate. Today, GM crops are planted on more than 167 million acres in America, according to this Pew study. Even the healthy fast-food chain Chipotle has confessed to using many GM ingredients, including soybean oil, in its menu items. Scientists have been working to invent GM foods that cure everything from blindness to world hunger. A huge portion of the world’s population survives on one bowl of rice per day, which leaves them vulnerable to disease and starved for nutrients like vitamin A. Genetic engineers created “golden rice” spliced with beta-carotene to fight vitamin A deficiency, which affects 250 million people and can cause blindness. The gene-altered rice has kicked up controversy, but farmers are expected to begin growing it in 2014. Studies on GM foods have not yet proven conclusively that these crops pose human health risks. One high-profile study by French scientists showed that lab rats exposed to GM corn and the pesticide Roundup developed tumors over time. The book Tomorrow’s Table by prominent U.C. Davis scientists Pamela Ronald and Raoul Adamchack makes the case that the only way to build a sustainable food system long-term will be to incorporate genetic engineering into organic practices. The global food supply is facing a growing crisis as drought conditions wipe out farmland worldwide. “Climate adaptation is the game every food producer and eater must now play,” noted a New York Times article this week. Many scientists argue that genetic engineering will have to play a critical role in creating foods that can grow in a warmer world. We can’t discount the potential benefits GM foods may provide for human health, the economy, and the environment. But we still need a broader body of research to determine, conclusively, whether they’re safe for everyone to eat over the long term. Until then, continue to choose-or grow-organic when you can.